As well as making weapons I am often asked to make more domestic items. My domestic iron work is made using the materials and techniques used by the original blacksmiths of the time. Some of my recent domestic iron work is shown below. This is a 16th century leather worker's stake. 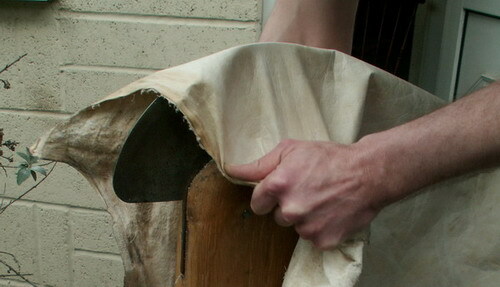 It was used for softening leather after it had been tanned. It has a half moon blunt iron knife set into a beachwood stand.